All boats in yacht charter in Croatia are equipped with standard equipment which includes deck equipment, safety equipment, navigation equipment, cabin and kitchen inventory. 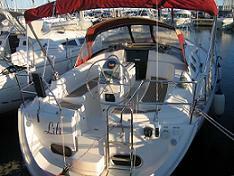 You can check equipment for each boat separately on boat link or in direct contact with agent. Deck equipment: steering wheel and/or tiller, compass, windex, main sail, genoa, el. windlass, anchor,chain, spare anchor, mooring ropes, fenders, manual bilge pump,plastic bucket, brush deck, water hose,tender, oars, pump for dinghy, el.cable 220V, swim ladder, gangway, stern shower, cockpit table, bimini or sun shade, etc. Safety equipment: life jackets, life belts, distress signal kit, fog horn, fire extinguisher, first-aid kit, hand lamp, tool kit, etc. Galley: speedometer, depth sounder, wind instruments, autopilot, GPS Chartplotter, VHF, hand bearing compass, winch handles, binoculars, maps for navigation, Adriatic nautical charts,Adriatic guide, triangle divider,plotter, pencil, etc. Kitchen Equipment: gas bottle, gas stove, el. refrigerator, sink, hot water, dishes, saloon table, CD player, etc. Cabins equipment: pillows, bed sheets, blankets. Some rental boats are better equipped than others. New and bigger charter boats are generally better equipped. Many of them have extra equipment as bimini top, sprayhood, bow thruster, teak deck, el. winches, GPS Plotter in cockpit, CD mp3 player and speakers in the cockpit, LCD TV, DVD player, Internet access, holding tank, generator, heating, air conditioning, radar, dishwasher, freezer,microwave oven,etc. Optional equipment on yachts in charter with extra charge: outboard motor for the dinghy, spinnaker, gennaker, racing sails, safety net, towels, extra set of bed linen, internet connection, fishing equipment, etc. Additional services with extra charge: final cleaning, pets on board, transfers, grocery shopping, obtaining permits for fishing, etc.